Under Gioia’s supervision, the Thunderbird has received many critical accolades, including being voted Motor Trend magazine’s Car of the Year for a record-breaking fourth time. Now the Engineering Director for Small FWD and RWD vehicles, Gioia shoulders the responsibility of Ford Mustang, Focus and Freestar as well as Mercury Monterey. More and more single women are buying homes on their own these days, while others are becoming solely responsible for their houses after a divorce, the death of a spouse or other relative? But for all these women, home ownership has its share of challenges and rewards. So, in a special week-long series called “Today’s Money for Women,” Jean Chatzky, “Today” financial editor and Money Magazine editor-at-large, discusses women and home ownership. In day one, Chatzky talks about why women are going it alone. At Jaguar and Land Rover we know that a luxury vehicle that appeals to women is not about a vanity mirror, but rather a combination of performance, reliability, and safety enclosed by a sleek, sensual exterior. We know this because like many automobile manufacturers, we place great value on the buying power of women. We have conducted targeted research studies in order to determine what matters most to our female customers when they are considering the purchase of a new vehicle. 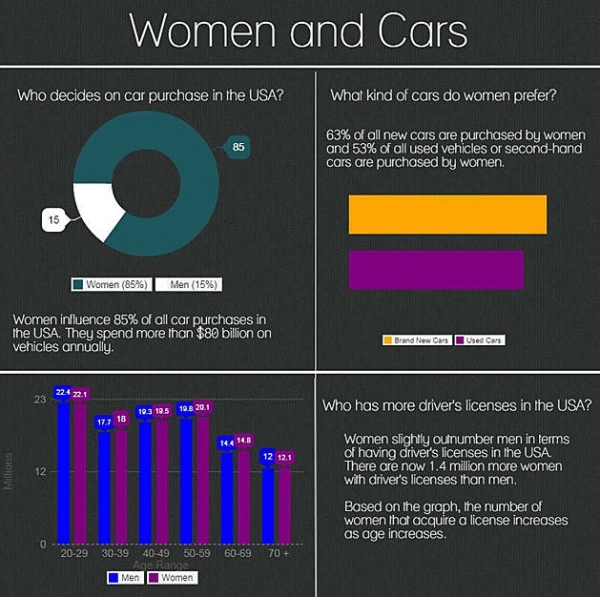 Not surprisingly, we found that women place value on many of the same qualities in a vehicle that men do. We are proud that our female buyers make smart choices based on performance, power, and style. Hostetter, Vice President of Advanced Product Strategy and Product Planning for Toyota Motor Sales, U.S.A., Inc., says most product improvements and breakthrough developments are made in response to consumer requests for certain features or performance.